Songbirds are exhibiting inconsistency in their songs and pollution appears to be the culprit, say Cornell University ornithologists working in a region with high levels of PCB contaminants. The article, published in the journal PLOS ONE, is based on observations from the Hudson River valley, a region with legacy levels of polychlorinated biphenyls (PCBs) as a result of decades of electronics manufacturing upriver. 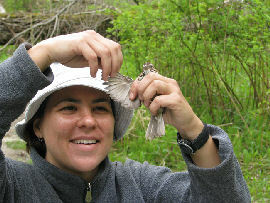 Researchers Sara DeLeon (pictured) and Timothy J. DeVoogd explain that for a number of songbirds, PCB-contaminated aquatic insects are their main food source. To investigate, the research team non-lethally measured total PCB loads, congener specific PCB profiles, and songs of black-capped chickadees (Poecile atricapillus) and song sparrows (Melospiza melodia). DeLeon says a key finding is that song disruption is tied to specific types of PCBs (there are 209 variations), differentiated by the positioning and number of chlorine atoms. DeLeon tested for 41 of these variations to isolate their effects.